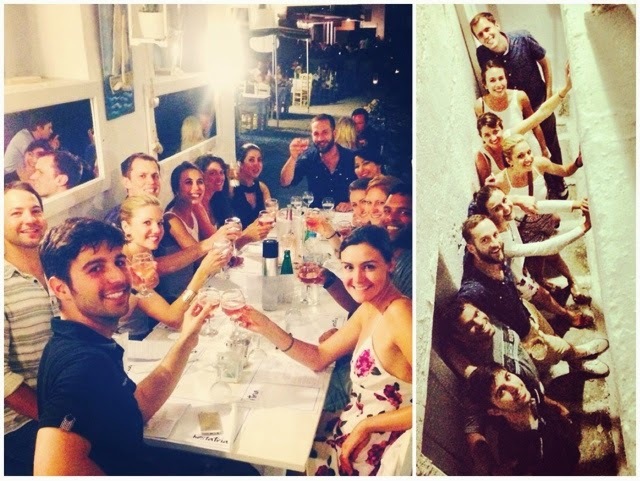 It was the first word I learned when I got to Greece, and it was really the only one I needed. 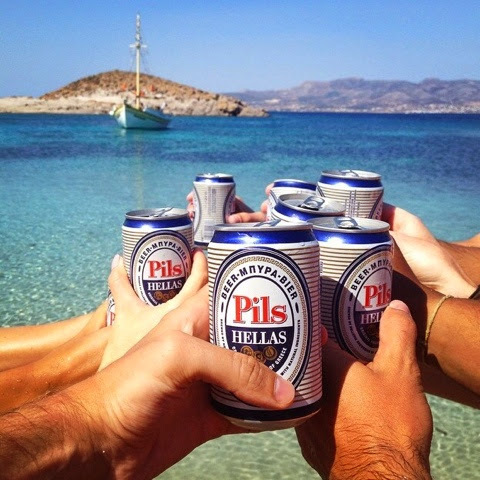 ...The perfect way to describe my magical vacation to the Greek Islands this summer. When my friend Sam messaged me a few months ago, casually asking if I was interested in going to Greece, I didn't need much convincing. (Like, zero). I booked my flight two days later. I was in desperate need of an adventure, and I consistently list Santorini as one of my top 5 places I've ever visited. 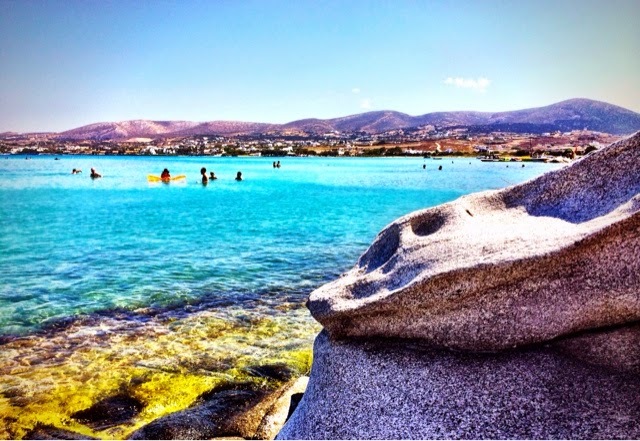 The plan for this trip was to stay on a smaller, lesser known island called Paros. I loved the idea of a more remote, "locals" destination. I was in. 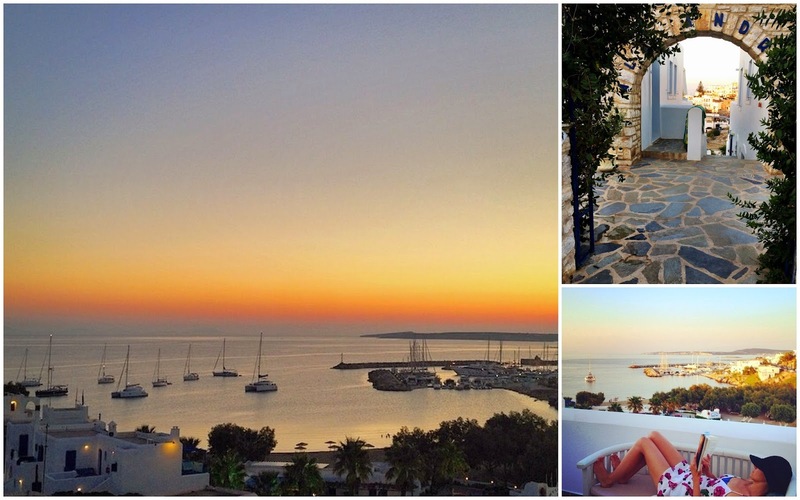 Our "home base" on Paros was Alexandros Apartments, which were perched atop a hill overlooking the sparkling Aegean Sea and the charming town of Naoussa. Our host, Litsa was so warm and welcoming, and in my mind what every Greek mother should be. (She also makes a mean Frappe!) It was a quick 5-10 minute walk into town each night, and a perfect spot to watch the sunrise. Our group consisted of 13 people. I realize that may sound like an unmanageable size, especially when you only know half of them. But for reasons I can't explain, it just... worked. Sometimes we did things as a big group. Sometimes, we didn't. And it wasn't a big deal either way. (We also created our own hashtag for use on Instagram for the duration of our trip. #encoregreececlub likely started to annoy our friends back home by the end of the 8 days, but we didn't care and excitedly shared our adventures on social media). We quickly adjusted to "Greek Life"... which basically consists of eating a late dinner (never earlier than 10, but sometimes as late as 11:30), heading to the bars around midnight or 1am, hitting the club around 3am, and stumbling home at some point after that (watching the sunrise is optional but encouraged at least once or twice). We would often sleep in until at least noon, grab some yogurt or falafel and head to the beach. Then back to the apartments, take a nap around 7pm, get up around 9. 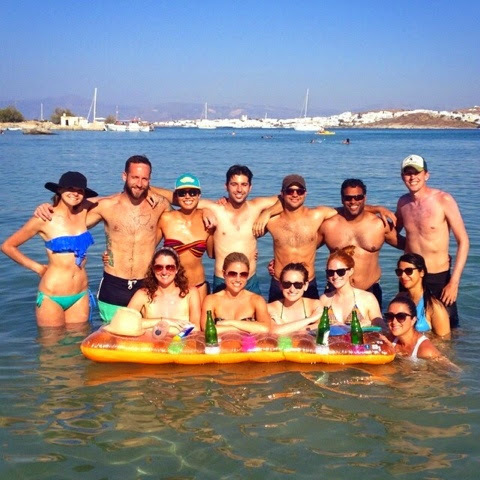 Our first group excursion was to Kolymbithres Beach. It's accessible from Naoussa by car or scooter, but we opted to take a short ferry ride across the little bay. Kolymbithres is filled with unique rock formations, which we climbed over until we found a perfect spot for swimming and playing paddle board. Eventually we migrated to a little beachy area, which had chairs and occasionally a waitress who would bring beers to us from the nearby restaurant. (By the way... if you walk up the hill to Taverna Kolymbithres, it's a beautiful little spot to grab a bite if you are visiting the beach). The next day, the boys rented scooters and four wheelers and we set off to explore the island with the wind in our face and only a beach day on our agenda. Santa Maria Beach Club fit the bill perfectly. Massages, beach chairs, crystal clear water, volleyball courts, & of course a beach bar (Don't miss the mojitos!) It was so much fun that we did it again a couple days later at Punda Beach Club. (Punda was bigger, and had two pools, but I think we actually had more fun at Santa Maria). 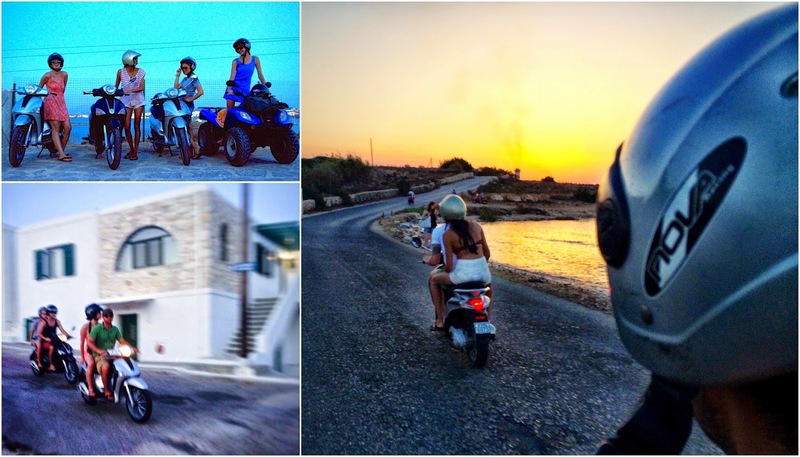 A sunset scooter ride back to Naoussa was the perfect end to our day. And honestly, I think we enjoyed cruising on the bikes just as much as hanging at the beach. It's truly the best way to explore the islands! 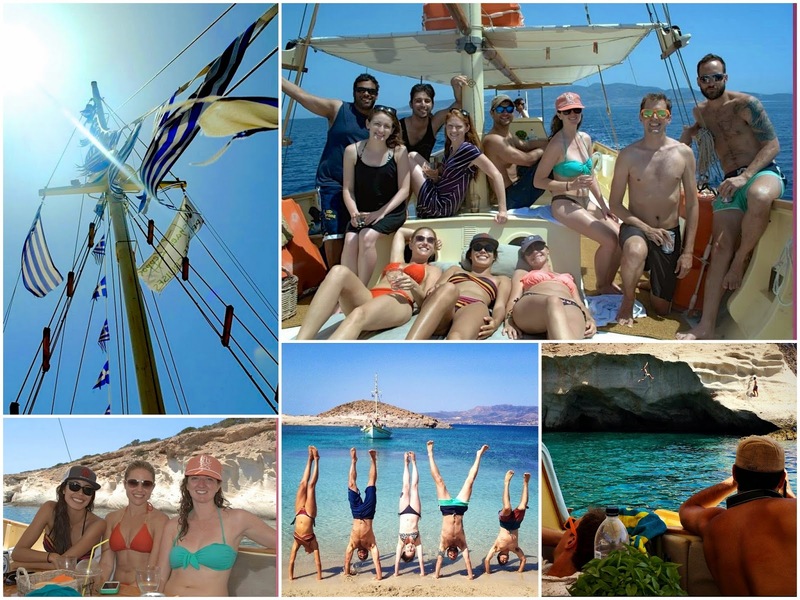 When I visited Santorini 12 years ago, I vividly remember an all-day boat tour and how much fun we had. So being the planner that I am, I had done a little research beforehand and discovered Michael Zeppos Boat Tours. On Trip Advisor, it's ranked as basically the best activity on the island, so I proposed the idea to the group over email about a week or so before our trip. Everyone was on board (pun intended) so I booked it. On the eve of our boat trip, I admittedly grew slightly nervous. When I delivered the news that we had to be at the port by 10:30 the next morning (see "Greek Life" schedule above), I got some death stares. When I then explained that the port we needed to go to was about 20-30 minutes away by taxi due to the strong winds near Naoussa, more disapproving looks. (Oh yeah, and by the way, everyone owes me 85 euros). But any hesitations were soon erased once we boarded Michael Zeppos. 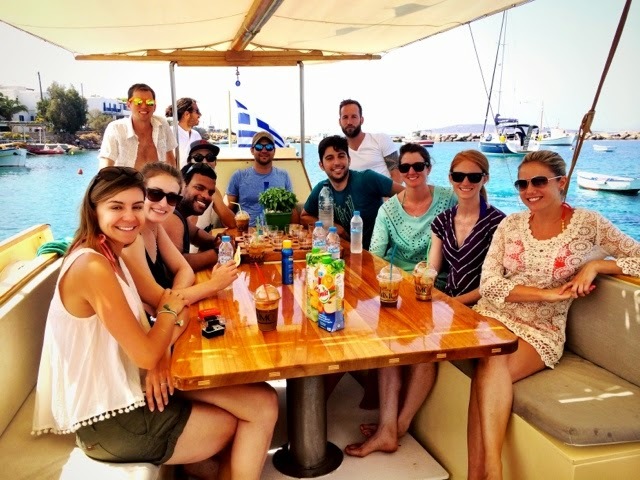 It is a beautifully restored boat, and our Captain Dimitris was friendly and knowledgeable. 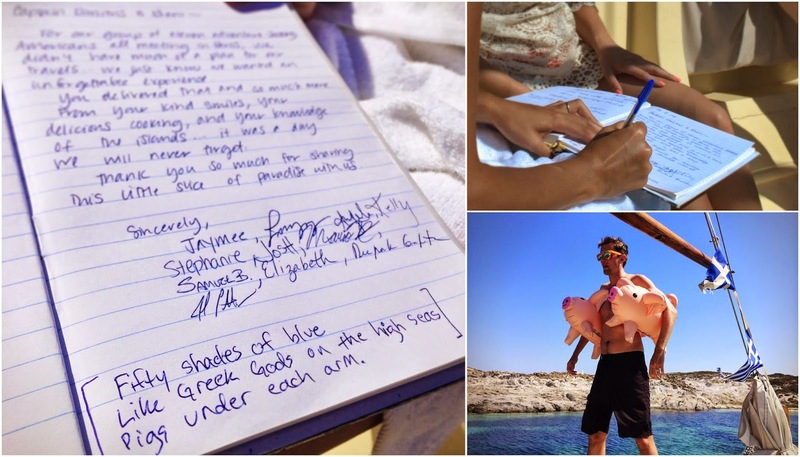 He took us to a cool little "pirate cave,"where we went snorkeling, a secluded beach on Antiparos where we practiced hand stands and acro-yoga, and found the perfect spot for our adventure-seeking cliff jumpers. The boat has been in his family for three generations, and you can really see the love and care that has gone into preserving it. Because it's basically a private charter, it's a little more expensive than the other tour companies, but I can tell you it is absolutely worth it. Especially when you cruise past the cheaper, group charter boat absolutely packed to the gills with guests. We had plenty of room to spread out aboard Michael Zeppos, and it was complete with shade, comfy sun beds, a large table that easily seated our group of 11, and possibly my favorite meal in Greece. 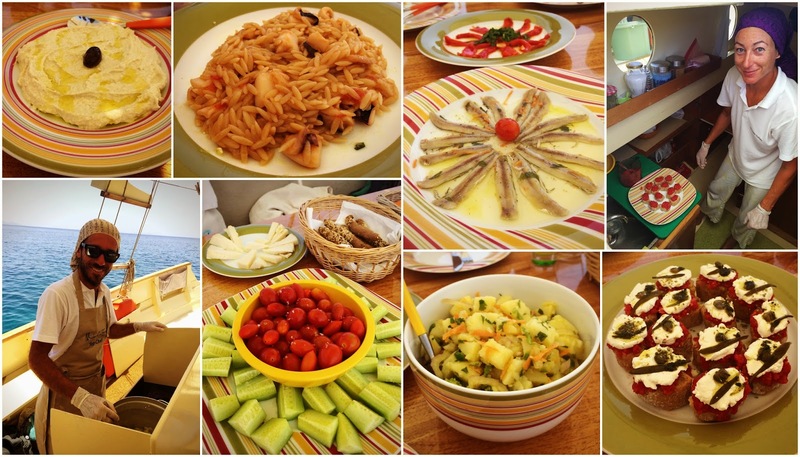 Dimitris and his first mate Elena prepared a feast. He brought several fresh vegetables from his garden, which we munched on throughout the day, along with wine, beer and local cheeses (and you know how I feel about cheese). They prepared lunch on board while we were swimming, and it was nothing short of fantastic. A light and fresh potato salad dressed only with olive oil, fresh herbs and sea salt. Crusty bread topped with roasted tomatoes, creamy cheese, capers and olive oil. Taramasalata, which is a mousse-like Greek meze made from fish roe and mashed potato (don't knock it 'til you try it). Fresh sardines, and a seafood orzo made with cuttlefish and tomatoes. We. Were. Stuffed. And if you still need convincing that this was the best excursion ever, here's our day summed up in about 15 seconds. Or if poetry is more your thing, a perfect haiku written by Lnzz Liebson. While we're on the subject of food (and this being a food blog after all), my favorite things to eat on this vacation were probably the most simple. 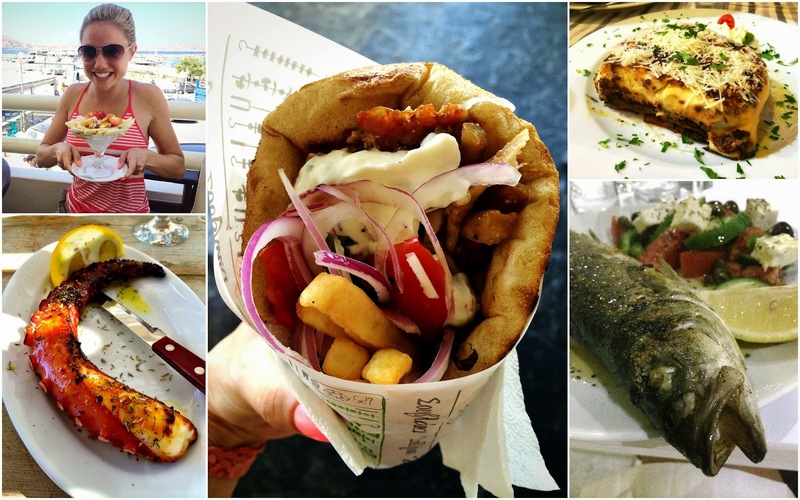 Grilled octopus (always freshly caught), gyros (with french fries! ), Greek salad (topped with a huge block of feta), falafel, moussaka, taramasalata... and perhaps the most simple and most favorite... Greek yogurt with fruit and honey, prepared each morning by a lady in a nearby cafe. And by the way... the Mediterranean diet is no joke. I didn't gain *any* weight on my 8-day vacation, which is a huge win. (Especially considering the amount of alcohol I consumed). For our final night on Paros, we actually ventured to nearby island Antiparos on a midnight ferry to meet up with a DJ we met earlier in the day at Punda. DJ Julio promised a memorable night and he definitely delivered. Antiparos was so charming and lively, it almost made me wish we had stayed there for a couple nights. After winding our way through the cobblestone streets lined with boutiques, we made our way to a plaza of sorts, surrounded by a dozen or so bars which all faced the open air square. For after hours, we headed to The Mill, a club inside of... you guessed it, an old mill. 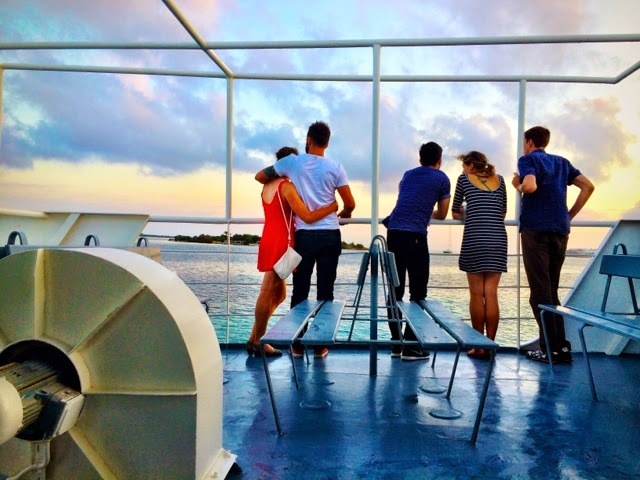 As we boarded the ferry and watched the sunrise, we prepared to say goodbye to our little slice of paradise. 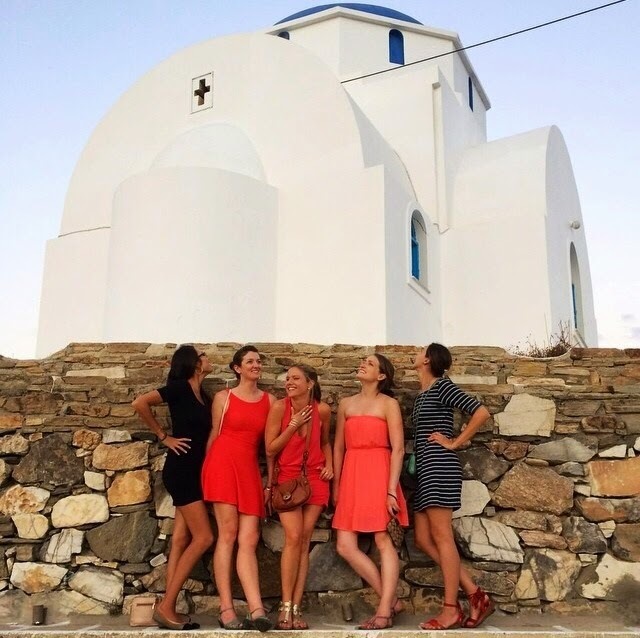 A few of us continued onto Mykonos for a couple of days before returning home (perhaps a blog for another time), but Paros will always have our hearts. Jaymee! That really looked like a fabulous vacation! The scenery looked amazing! If the food was as good as it looked, not much more you could ask for! What are your plans to top it? looking forward to hearing about it. Jaymee! That looked like an absolutely fabulous vacation! The scenery looks amazing! If the food was as good as it looked, what more can you ask for? How are you planning on topping that vacation? Can't wait to hear!